Download Chipsbank CBM2093 format tool and repair corrupted Chipsbank USB pendrives .Download cbm2093 umptool v3.3.8.7 to fix CBM2093 flash controller firmware . Cbm2093 umptool v3.3.8.7 has been designed to format Chipsbank flash drives that have chip part number CBM2093 controller .CBM2093 umptool v3.3.8.7 can fix chipsbank format errors such as write protected flash drive , Please insert disk error message ,Windows unable to format disk error message ,raw flash disk and other chipsbank format issues . Cbm2093 umptool v3.3.8.7 support repairing CBM2093A0,CBM2093A1 only so please don't use it with different chip vendor .You must determine your USB flash disk chip vendor first then search about your flash firmware depend on Chip controller model ,you can use Chip genius software or USBDeview V2.30 utility . .
How to repair Chipsbank cbm2093 Pendrive ? First download chipsbank_CBM2093_UMPTool_v3.3.8.7.rar from download links below . Insert corrupted Chipsbank CBM2093 Pendrive to your PC. 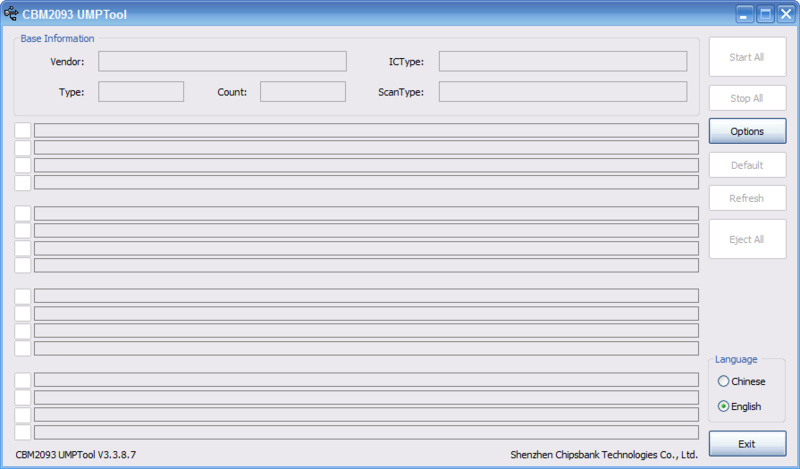 Extract chipsbank_CBM2093_UMPTool_v3.3.8.7.rar and open cbm2093 umptool v3.3.8.7.exe . If your flash drive supported , you will see your flash info appears on the program interface . Click Start ALL to begin updating Chipsbank CBM2093 firmware . Wait until finish formatting your flash disk . hi , i really couldn't find the exact tools for my this flash drive please help me out. thanks! my flash drive is being corrupted and left with 7.3GB left after i use all of the scanning. Hi Andrew. Looking at the info you posted, your Chip Part-Number is CBM2093. You will need to use Cbm2093 umptool v3.3.8.7 which is the first one on the list.